The next generation Porsche Boxster, which has adopted the ‘718’ badge in keeping with the 911 naming convention, has officially launched in Geneva. It’s on sale now and priced from just under £42,000, with first deliveries due in April. It looks familiar, of course, but Porsche says that only the bootlids and cloth hood are carried over from its predecessor. The engine, on the other hand, is extremely unfamiliar, with the 718 becoming the first Boxster powered by four-cylinder turbo units. 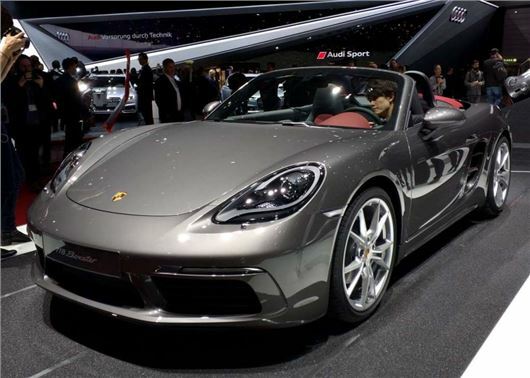 In the base Boxster it produces 300PS, while the S model gets 350PS. Both are a 35PS improvement over their two-pot-superior forebears, while the former tops 40mpg average, and the S posts 38.7mpg economy. Torque is improved by over 25 per cent in each case, and peaking at lower revs (below 2,000rpm), which is the thing that will most fundamentally shift the character of the Boxster this time around. Choose a seven-speed PDK automatic and the S will get to 62mph in 4.2 seconds, and the lower powered 718 4.7 seconds, with the standard manual version of each very slightly slower owing to you and your lackluster left leg. As is fast becoming the norm, the infotainment setup includes Apple Carplay, and if you spend on Porsche Active Suspension Management you can lower the ride height by 10mm, as well as softening the damping, if you like.